When you think of major home improvements you are talking about major financial investments. Remodels, appliance upgrades and projects like HVAC installation can be a significant expense. Whether you are considering a new HVAC installation in Houston or just replacing your old system; you want to get a ballpark idea of what something like that is going to cost you. With HVAC installation though—it’s not a universal price for every home. It would be much simpler to shop for a new HVAC system if that were the case but there are many variables and factors that can impact HVAC installation cost. What you have to realize is that aside from contractor’s labor costs, markup, and available rebates and discounts—there a lot of other factors that many Houston homeowners overlook that affect the cost of a new HVAC installation. If you’ve already shopped for an HVAC unit in Houston you may already know that AC units are like cars, they come in all different sizes, packages and can come with as many features as you can imagine. From your basic single stage cooling system with a regular thermostat to a top of the line variable speed unit with a smart thermostat—the variation in size, features, efficiency, andcooling capacity can all have a significant impact on the entire cost of your installation. At Airteam, we can help you find the right system for your homes needs with a simple free home visit. When we talk about the sizeof an HVAC unit, most people think we mean physical size. While that is also an important factor to consider; what we really mean by size is the unit cooling capacity. The larger the size the larger space the system can cool, which means higher cost as well. That is why is very important to choose the unit that is just the right size for your space—not too big and not too small. That comes as a shock to some people—that you can buy a system that’s too big. Yes contrary to the Texas mantra that bigger is better, this isn’t true when it comes to HVAC systems. If your unit is TOO SMALL, it will have to work extra hard and run nonstop to attempt to cool your home. In the end,the home will never cool properly and your electric bill will be astronomically high. On the contrary, if your unit is TOO BIG it will actually cool so fast that it fails to have time to remove humidity in the air. So you will end up with a cool but humid climate which is also uncomfortable. Also, your unit will constantly cycle on and off which will greatly shrink the life of the unit and will break downmore often. At Airteam we prevent this from happening by measuring your home, taking into account your comfort preferences, the contents in your home, the shape and location of the cooling zones and more. We will ask you a lot of questions regarding how you use your home and space,but rest assured when we are done your home will be at maximum efficiency and comfort. If you’ve read our blog on HVAC terms you should know— thenyou already know that SEER ratings measure the energy efficiency of air conditioning systems. The higher the number, the greater the efficiency and the greater the cost. While more efficient systems will cost you more upfront; in the long run,the increase in price can be mitigated by energy savings over time. When you see a quote for an HVAC system that is typicallyfor the system alone. Adding other equipment to complement your HVAC system will add to your costs. Items such as UV air filtration systems can add up and bloat the cost of your unit. If your house has existing central air you are in luck. Replacing an old HVAC system in Houston costs significantly less than adding central air to a home that does not already have this system in place. The reason is that ina home with no central air there is more labor to install ductwork, decking, drains, and wiring for the equipment. Even if your old system needs some repairs it is still less expensive than a completely new install. Size of your home and the diameter of the ductneeded to reach every part of the home. When ductwork is installed your contractor will also need to place supply and return vents to circulate the air through your home and heat or cool the space. The more rooms you need cooling for the more supply and return vents that will be required. 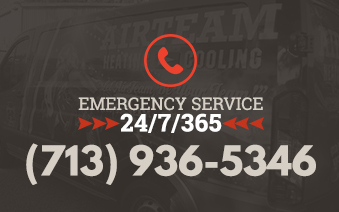 Skip The Guesswork And Call Airteam For A Free Quote Today! You can do your own research—believe us, we love informed customers because we give it to your straight when it comes to your HVAC needs. We don’t try to upsell you on features you can’t use or don’t need—we just build you the right system to satisfy your comfort levels every time.